Seals roofs, decks, balconies, and elevated walkways from water leaks, protecting against costly water damage. Protects below grade foundation elements such as foundation and retaining walls, concrete slabs, and footings. 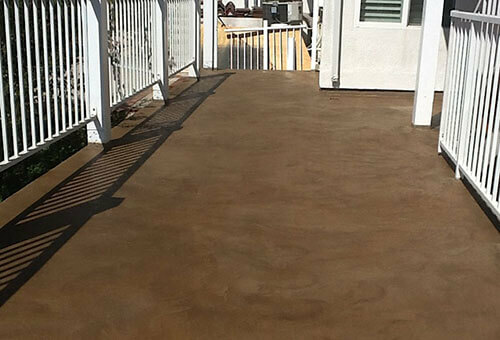 Tuff Kote Systems is the best value for residential waterproofing in both Orange County and the greater Los Angeles area. We have over 25 years of experience in resolving all types of above grade and below grade moisture problems for homeowners and residential communities throughout our service area, working in conjunction with our general contracting division, General Contracting Group. At Tuff Kote Systems, we take great pride in our ability to diagnose and effectively resolve leakage problems in such residential housing components as roofing systems, decks, elevated walkways, and balconies, as well as below grade moisture issues such as groundwater and surface water seepage through supporting structural members such as foundation and retaining walls, footings, and concrete slabs. The exceptional quality waterproofing systems we offer to resolve both above grade and below grade moisture problems are competitively priced, and are the longest-lasting, most innovative available in the industry today. Water leakage through residential building elements such as roofing systems, decks, and balconies located over living areas can cause significant damage to the interiors of their associated structures. Water can gain access to a home's interior through points of entry such as damaged areas of the roof, around improperly flashed roof penetrations, or through damaged deck or balcony coatings. When this happens, water damage to drywall, insulation, woodwork, flooring, and other interior surfaces can occur, resulting in the need for expensive home repairs. And below grade, supporting structural members can be seriously damaged by exposure to ground and surface water, which can cause concrete spalling, reinforcing steel corrosion, and the formation of cracks in the home due to the effects of structural settlement. But this is only the beginning of the problems excessive moisture can cause. Whether it comes into the home from above through the roof or a deck, or seeps up from below, this excessive moisture can encourage the growth of mold and mildew within the home's envelope, causing serious structural damage and adversely affecting the health of the home's occupants. Don't let above grade leakage or below grade water seepage problems cause damage to your home, call the residential waterproofing experts at Tuff Kote Systems today. 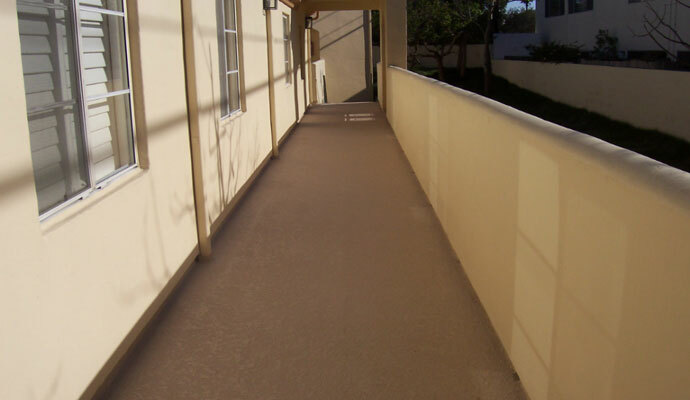 We provide our exceptional quality waterproofing services to all of Orange County and the greater Los Angeles region, and provide estimates throughout our service area. Our business hours are Monday through Friday, from 8:00 am to 4:00 pm, and we accept Mastercard, Visa, American Express, and checks. Tuff Kote systems is licensed, bonded, and insured.